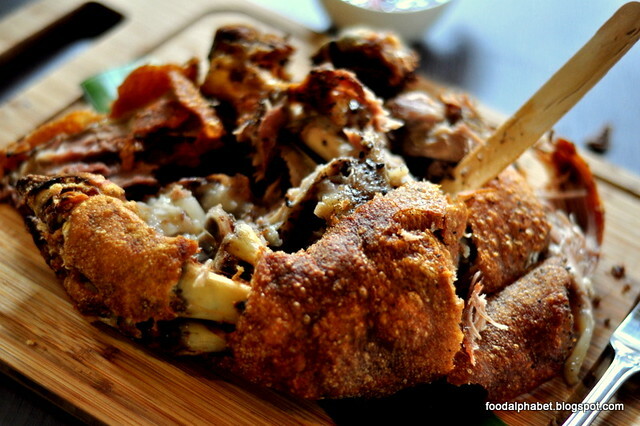 The Food Alphabet and More: Livestock in Quezon City where good friends and Crispy Pata meet! 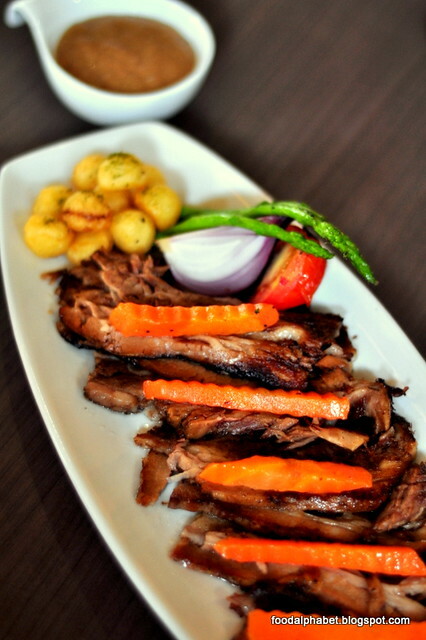 Livestock in Quezon City where good friends and Crispy Pata meet! 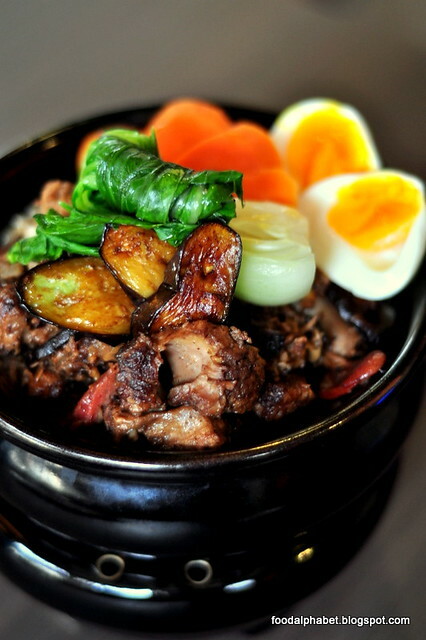 Livestock, the so-called "Pork Heaven" is a must visit when you dine-in at Quezon City, why Pork Heaven? 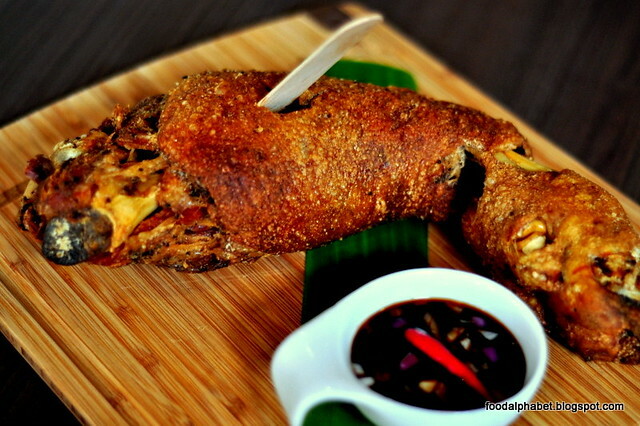 Well, this is home to their famous Crispy Pata, so crisp and tender, you can literally cut it open with a Popsicle stick! I'm serious, at first I was skeptical and thought it was just for decoration purposes and when the action started going, I find myself in awe and excitement as I smell the aroma and hear the crisp skin crack with every slice, join me in this food discovery, and maybe you'll find yourself dining at this Pork wonderland really soon! Livestock opened late last year and already has a flock of followers doing regular weekend gigs, drinking the night away, what many do no know is that they serve really great food here! Notably their love for pork is just plain insane! But other than their pork dishes, they whip up a great deal of other healthy dishes (I think), that you may find amazingly good as well. 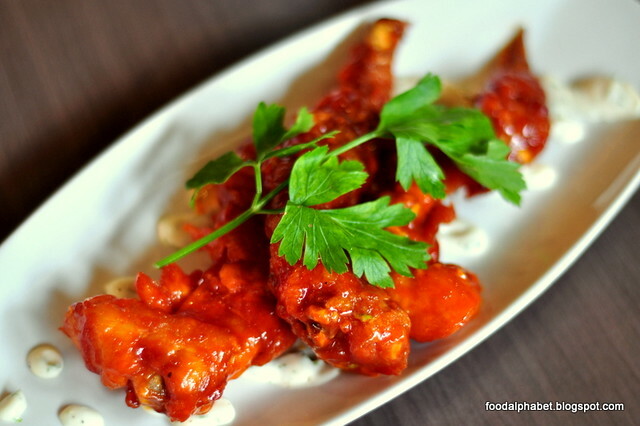 Crisp fried bacon wrapped chicken wings in buffalo sauce, and now the bacon starts, I mean the fun starts. 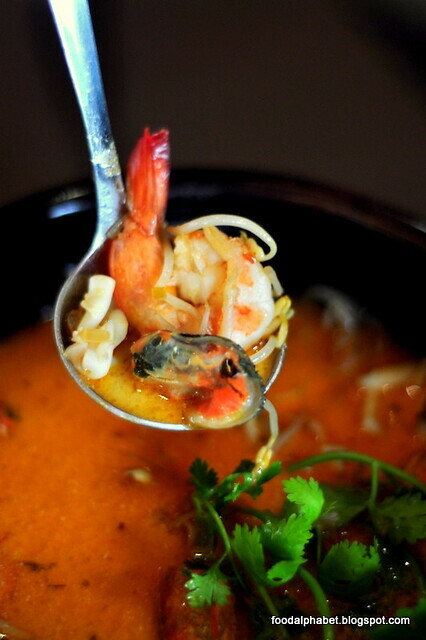 A seafood soup made perfect with fragrant, spicy laksa broth with a hint of refreshing sourness, is the right recipe that Filipinos will definitely love. Balancing the right sour and spice is a tricky thing but Livestock made it the best rice partner... rice please! With generous amounts of pork, Chinese sausages, veggies and eggs, this is not just a rich man's pot, but rather a pot worthy of a king! Just say how much you can eat, and Livestock would gladly serve it for you! One thing I can guarantee about Livestock is that they have perfected the art of serving pork dishes, and the Crackling Pork Belly is proof no. 1 that they indeed are one of the finest in the metro. While everybody was still busy with the other dishes, I took the liberty of getting the knife and slowly cut through the crisp skin and portioned my belly to a minimum trying to enjoy every bit of it as it rolls down my taste palettes. And it was indeed a very satisfying moment. 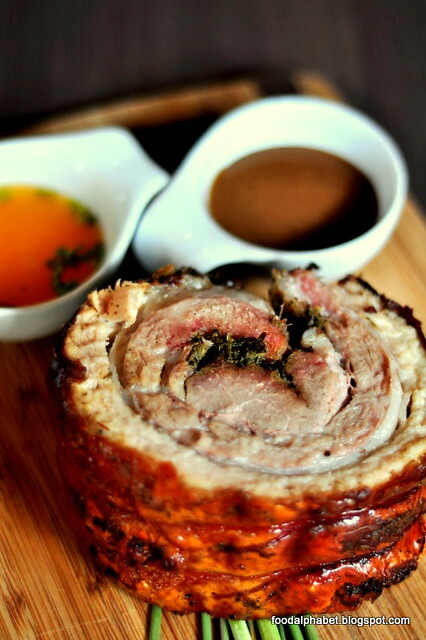 Stuffed with fresh herbs and roasted to a crisp, then dipped in either lechon sauce or spiced vinegar, any which way, I would say this is one of the best roast pork belly indeed in the metro, kudos to you chef! 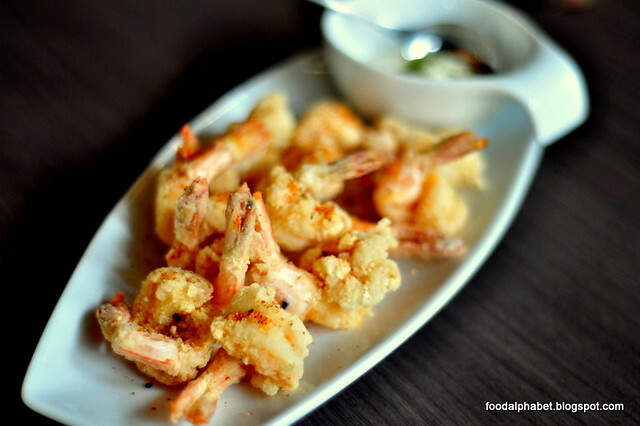 If there is one dish that would take Livestock places, then this is it! The Crispiest, most tender Crispy Pata you will ever taste in this lifetime, that you can even slice it with a popsicle stick, I kid you not! See how it is done. Just by the look at how he easily slices through that crisp skin with the popsicle stick, oozing out that sweet aroma of the crispy pata, one can't help but salivate at this sight. After all that has been done, now we can finally enjoy this fantastically amazing Crispy Pata treat. Now I got to shut up and start munching, there might not be any left for me. It's Crispy Pata time! 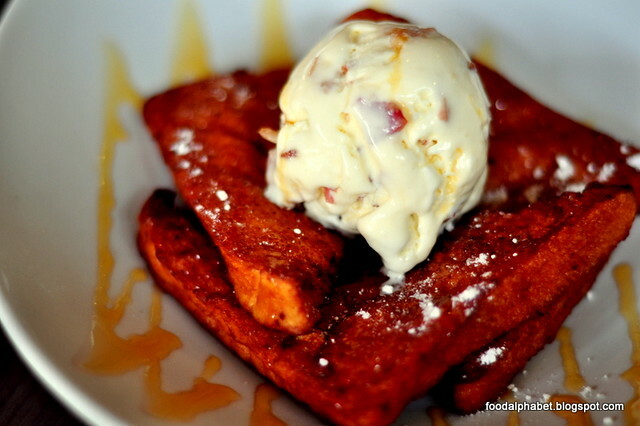 As the name implies, it's vanilla ice cream infused with bacon bits on top of crisp french toast, talk about tempting desserts, this definitely takes the cake! And they really taste good too. 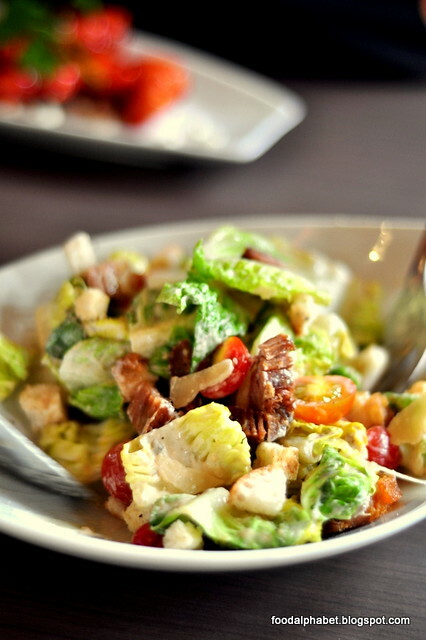 Try it out and tell me if you can resist not getting another serving of this. 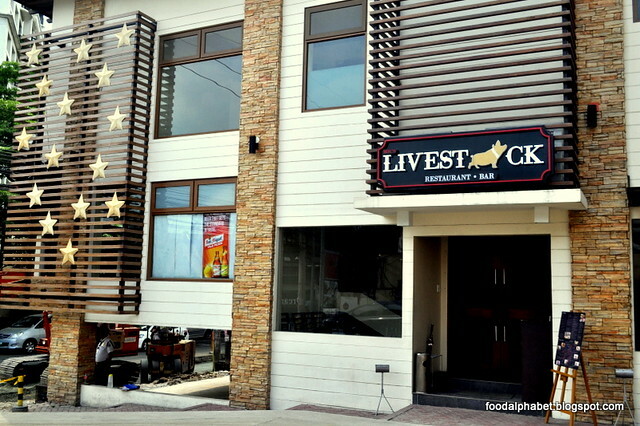 Be sure to visit Livestock, the next time you do chance by Quezon City, I promise you will enjoy every porky bit of it! See you there! Be part of the Mega Food Tour! Weekend at Vikings just got better!!! Diamond Hotel lauds the best mom!! P20.00 Burger at T.G.I.Fridays on May 8!